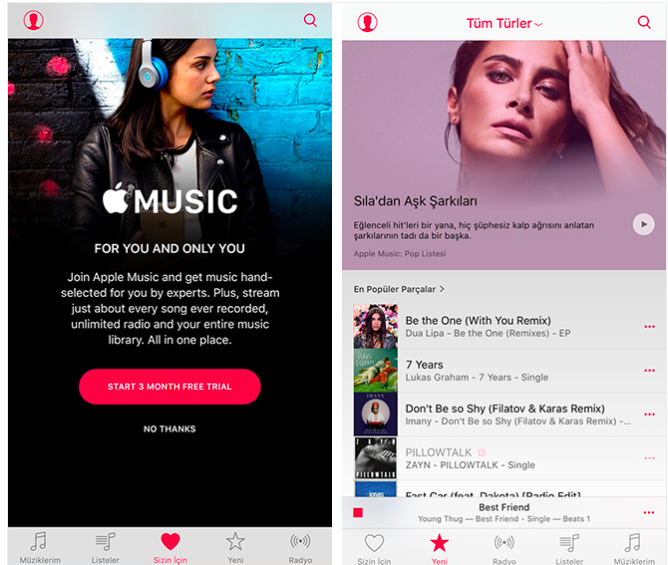 Apple announced today that Apple Music is now available to customers in Turkey. The news was shared by Oliver Schusser, vice president of iTunes International. Apple Music launched around the world in June, 2015. Apple Music was not originally available in Turkey because of copyright issues. Turkish artists were finding Apple’s royalty payments too low. These issues seem to be fixed now. Apple Music costs 9.99 TL (around $3 USD) a month. Family Plan costs 14.99 TL. Apple also offers a 3-month free trial. Oliver Schusser also stated that more than 30 million songs are available via Apple Music. Apple Music in Turkey features music from famous Turkish artists including Demet Akalın, Gülşen, Teoman, Funda Arar, Ceza, Kaan Tangöze, Göksel, Buray, Merve Özbey, Halil Sezai, Koray Avcı, Ayşe Hatun Önal, Gülben Ergen, Enbe Orkestrası, Fazıl Say, Edis, Deniz Seki, Güliz Ayla and Sıla.